Illinois State Police, Arlington Heights police and firefighter/paramedics responded about 5:15 PM Sunday July 9, 2017 to a report of a vehicle fire on I-90 near Mile Marker, Arlington Heights, Il. 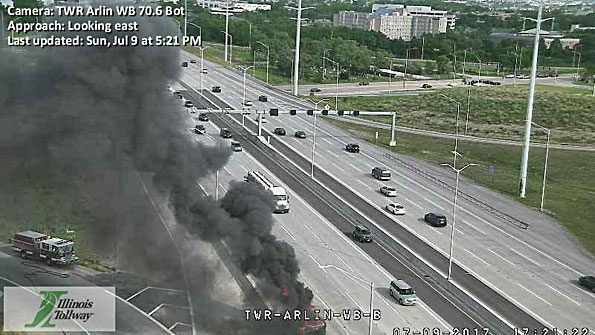 Engine 3’s crew on arrival reported a fully-involved box truck fire, just short of the entrance ramp on westbound I-90 from southbound Arlington Heights Road. The truck was parked on the shoulder of the express lanes of westbound I-90. Engine 3 attacked the fire from the ramp. Elk Grove Township Engine 11 attacked from the right lane in the express lanes of I-90. The truck driver reported the cargo was furniture. The engine block is magnesium, and was lighting up when water was applied, according to E3 crew. The fire was mostly under control by 5:28 p.m.
After Arlington Heights Engine 3 nearly emptied their tank, Elk Grove Township 11 was hooking up to a hydrant and feeding Engine 3. There were possibly two lines used on the fire, and possibly a change of plans with Engine 3 feeding Engine 11.